A collection of old motorcycle magazines was recently given to me to peruse and possibly use for research. As I dug deep into the pages, I came across an article looking back at Lee Taylor’s 1914 victory at the FAM 300-Mile National Championship race in Savannah, Georgia. The Savannah event was held on the roads around the city called the Grand Prize Circuit, the same course that hosted the Vanderbilt Cup, at the time one the most prestigious auto races of the 1910s. The FAM 300-Mile Championship was also one of the most important motorcycle races during a golden age of the sport when a dozen or so American motorcycle makers were involved in racing. Lee Taylor was among the earliest generation of motorcycle racers in America. He rose to fame riding for was Emblem, but claimed his biggest victory with Indian. Lee Taylor is in the Motorcycle Hall of Fame, primarily for his win in the Savannah race, but over the years very little information was found on him and in there is no biography on the Motorcycle Hall of Fame’s website. I decided to take a dive into trying to find info on Taylor. It was difficult and long process, but thanks to a research librarian at the Columbus Metropolitan Library named Chuck Cody, I was able to piece together a least a trace of Taylor’s life. From Cody’s research is appears Taylor was born and raised in the area of Uhrichsville, Ohio. The problem with researching Taylor was that his last name was so common and he sometimes went by Lon or L.S. Taylor. The census of 1900 shows him living in nearby Tuscarawas, Ohio, married to Allie with a daughter of two named Erma. The census listed Taylor’s occupation as stationary engineer. There are vague newspaper articles that indicate he may have been racing in local events in eastern Ohio as early as the middle of the 1900s, which would have put him among the earliest generation of motorcycle racers. First mentions of him in trade publications show him working at the American Machine Company in Columbus, Ohio, the city’s dealership for the Emblem Motorcycle Company. 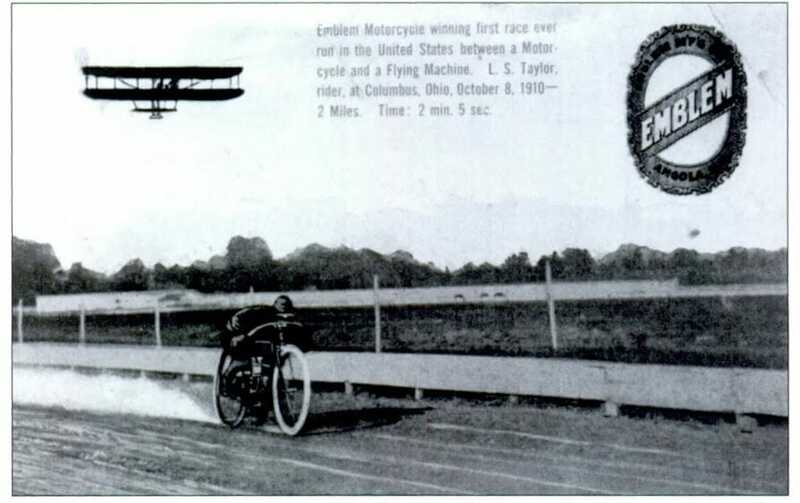 Taylor rose to fame in 1910 by racing a “flying machine” on the mile dirt track of Columbus Driving Park in Columbus, Ohio. Taylor and his Emblem beat the airplane, a Wright Model B, flying above. Emblem used the feat of Taylor’s victory over the plane as a major part of its PR and advertising materials. In what was most likely a publicity stunt dreamed up by Emblem, Lee Taylor raced a Wright plane flying above a mile dirt track in Columbus, Ohio. Emblem touted this “victory” prominently in its advertising. 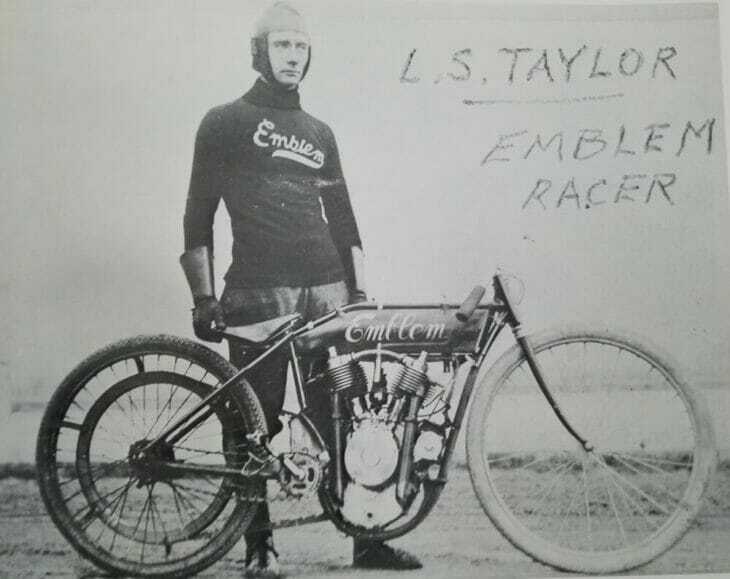 Taylor found racing success with Emblem and he likely would have stayed with the company, but he gradually found that Emblem was not serious about racing. Emblem was happy for Taylor to race production bikes, but that would only get him so far against factory racing specials, so he in 1913 he took an offer to race for Flying Merkel. At the Elgin National Road Race in 1913, Taylor was lead rider for Flying Merkel, a team billed as the “Yellow Jackets”. The race bikes were painted bright yellow and team riders donned yellow and black riding gear. Flying Merkel teammate Ray Snyder led early with Taylor a close second. When Snyder pitted for adjustments Taylor took over the lead. Indian’s Charles “Fearless” Balke came up to challenge and the two battled for the lead. On last lap a tire puncture ended Taylor’s bid for the win and he limped home to sixth. Indian’s Balke and Charles Gustafson finished 1st and 2nd. During the in a lead up to the 1914 FAM convention, a Flying Merkel squad with Taylor teaming with Cleo Pineau and F.E. French won the Rider’s Trophy in the Chicago to St. Louis FAM National Endurance Run. The 1914 edition of the 300-Mile Championship proved to be one of the most seminal races in the history of motorcycle racing. It marked the first time Harley-Davidson entered a full-fledged factory team. Earlier that summer Harley supported several riders in the Dodge City National races, but they were trounced. Smarting at the loss, Harley officials decided to build factory racing specials and make a big splash at Savannah late that fall. It was under this backdrop that Savannah in 1914 took on major importance to Harley-Davidson, but to the other manufacturers as well. Lee Taylor was part of the top-dog Indian factory squad at Savannah that year. It appears Taylor may have been signed specifically to strengthen Indian’s efforts in that late season race. Since Taylor had been one of the top competitors at the Elgin National Road Race, Indian knew he had the skills to win at this type of competition. An article looking back at Taylor’s biggest victory – his win at the 1914 Savannah FAM 300-Mile National Road Race. Race morning in Savannah it was so cold there was frost on the ground. Mechanics has to build fires to heat up the oil that had gotten thick as molasses in the overnight chill. Riders wore multiple layers of sweaters for the race. 32 riders took the starting flag at 9 am. Pushed off in groups of five, one minute apart. The course was 11.25-mile circuit – 27 laps for the final. Martin Schroder led in the early miles for the upstart Harley-Davidson team followed by Bob Perry on an Excelsior and Indian’s Red Armstrong. But Taylor was consistent and his factory Indian crew completed fast pit stops. Taylor took the lead by the halfway mark and went on to score victory with an average of 61 miles per hour. His finishing time of five hours, two minutes and 32 seconds broke the previous record by 20 minutes. It was easily the biggest win of his career. Taylor’s prize money for the Savannah victory was $150, at a time when a good job paid $11 per week. Joe Wolters finished second on an Excelsior, 11 minutes behind Taylor and Irving Janke third on a Harley-Davidson making for three manufacturers on the podium. Indian rewarded Taylor by signing him for 1915 and ’16 racing seasons as well. Then tragedy. During a dirt track race on July 4, 1916 in Hamilton, Ohio, Taylor and Harley rider Maldwyn Jones collided. Lee suffered compound leg fracture. Infection set in and doctors tried to save Taylor’s life by amputating his leg, but it was too late and he died two weeks later on July 16 in Hamilton’s Mercy Hospital. Stephen Wright, author of the seminal book “American Racer” interviewed Maldwyn Jones, who recollected the crash that led to Taylor’s death. 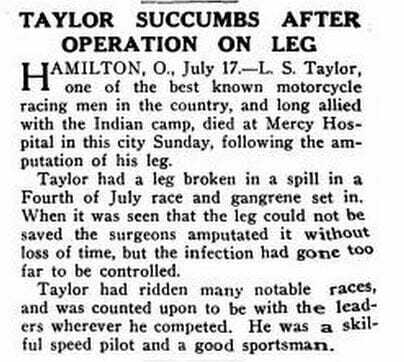 Unfortunately, death was all too common for motorcycle racers during this period of the sport and the only notice of Taylor’s passing came in a small three-paragraph news item in Motorcycle Illustrated. 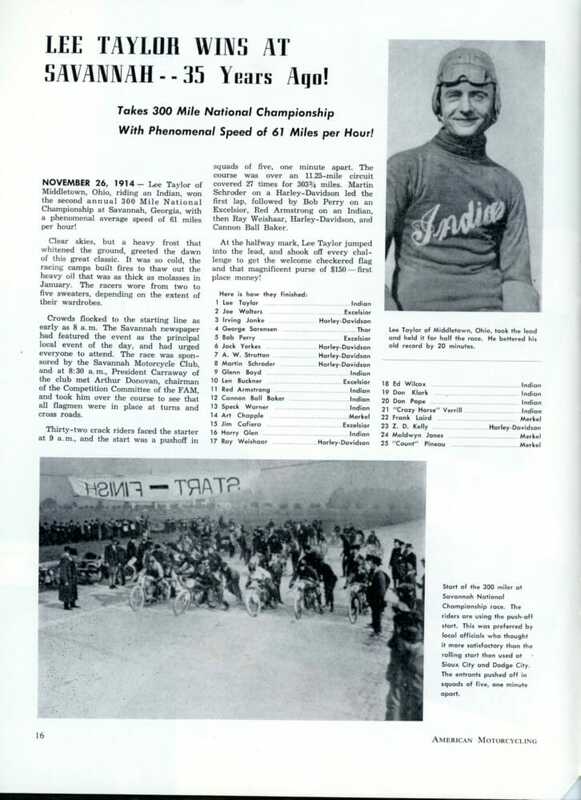 Taylor’s obituary in Motorcycle Illustrated.